The global cosmetic skin care market is moderately consolidated, with the top five players accounting for 45.3% of the total market in 2015. L’Oreal S.A., Procter & Gamble, Unilever PLC, Beiersdorf AG, Avon Products Inc., and The Estee Lauder Companies Inc. are some of the prominent players in the global market for cosmetic skin care, with L’Oreal S.A. accounting for the dominant share that year. The company enjoys an extensive presence across all geographic locations and concentrates on diversifying its product portfolio by understanding the requirements of end users. For example, L’Oreal S.A. invested US$848.7 mn for R&D in 2014 while Unilever PLC raised US$955.0 mn for the same cause that year. Key players in the global cosmetic skin care market are also indulging in acquisitions to maintain their hold over the market. For instance, Unilever acquired the world’s leading professional skin care brand Dermalogica in June 2015. 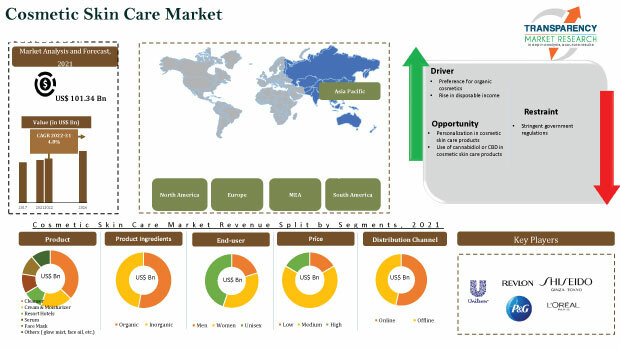 In terms of revenue, the global cosmetic skin care market was valued at US$127.16 bn in 2015. The market is expected to witness a healthy CAGR of 5.1% during the forecast period of 2016 to 2024 to reach US$200.56 bn by 2024. Geographically, Asia Pacific accounted for the most significant share in the market for cosmetic skin care at a value of US$46.26 bn in 2015, followed by North America and Europe. According to the research study, Asia Pacific will continue to dominate the market with a robust CAGR during the forecast period while North America and Europe will also sustain a healthy growth rate. By product, anti-aging cosmetic products accounted for the maximum demand at US$26.54 bn in 2015, followed by skin whitening cosmetic products, and sensitive skin care products. By application, minimize wrinkles will remain the leading segment throughout the forecast period. Consumer trends for cosmetic skin care products vary from region to region. Skin brightening creams form the leading segment in Asia Pacific because Asians tend to prefer brighter skin as they find it more attractive. In western countries, the focus is on achieving toned skin rather than a particular skin color. As a result, the anti-aging products market is booming in these developed regions. Consumers prefer using anti-aging creams and different skin care lotions to look young and hence, the global aging population is one of the most prominent drivers in the global market for cosmetic skin care. The report also observes that the demand for cosmetic skin products made from natural ingredients is gaining popularity as consumers perceive it to be safer, more trustworthy, and as having higher standards of quality. Innovative products, attractive marketing strategies, and changing lifestyles are also evaluated as drivers in the global market for cosmetic skin care. Conversely, the increasing side-effects of cosmetic skin care products is seen as a major restraint on the market. According to dermatologists, people are being exposed to higher doses of chemical content in skin care products than before, leading to a sudden rise in allergies known as contact dermatitis. This is a medical condition wherein the skin becomes red, itchy, and can sting and blister.